I've been getting into a chocolate rut. Not that there's anything wrong with chocolate or lots of it, but I noticed every time I went to bake a dessert item it almost always was 100% chocolate based. 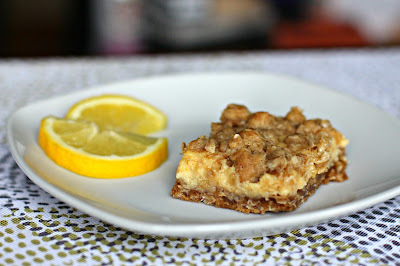 Lemon bars have been on my "must make" list for quite a while, and since I buy lemons almost every time I go food shopping I found that I had more than enough stock piled to make a zesty and fresh recipe. After searching around I landed on this one. What really stuck out to me was the crumble on top, the crust, and the creamy center. These were a huge hit in the house, but you definitely want to eat these cold. They are OK warm out of the oven, but sticking them in the fridge for a bit and eating them nice and cool is definitely the way to go. 1. Heat oven to 350. Grease an 8x8 baking dish. 2. In a large bowl combine the flour, oats, salt, and baking soda. Mix in the white and brown sugar. Combine the vanilla and melted butter together then add it into the dry ingredients. 3. Take half of this mixture and press it firmly into the bottom of your baking dish. Bake for 15 minutes. 4. 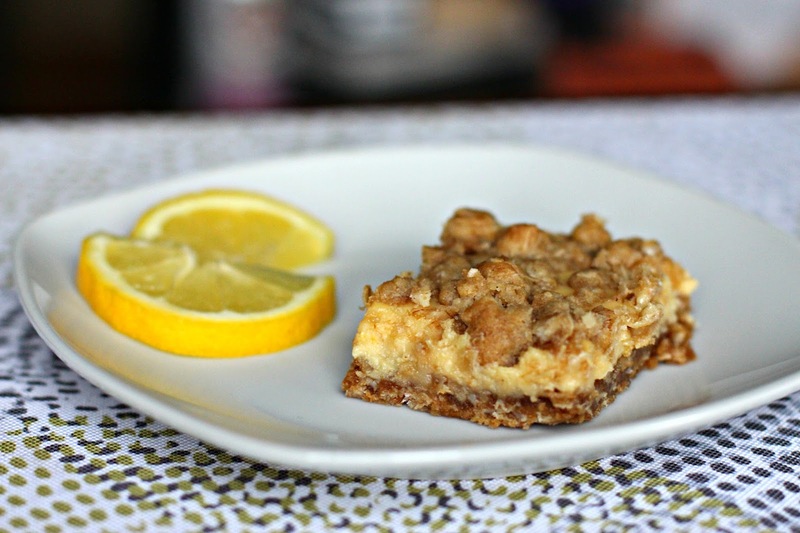 Mix together the condensed milk, lemon zest, lemon juice, and egg yolks. Once the crust is done baking, pour filling on top of the baked crust. Take remaining crumble and sprinkle it over top. 5. Bake 20 minutes. Let cool and then refrigerate.